In a hotly anticipated battle of light welterweights, Argentina's Marcos Rene Maidana upset top American prospect Victor Ortiz in a fiery explosion of power punches that exceeded expectations at Staples Center in Los Angeles for the Interim WBA title. 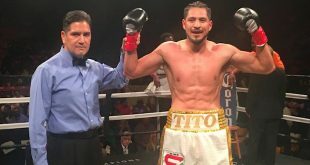 Both boxers were coming off high profile bouts with Ortiz seeming to have the momentum following his second round stoppage of highly touted Mike Arnaoutis for the NABO and USBA crowns while Maidana had narrowly missed knocking off WBA titlist Andriy Kotelnik. The initial round was torrid as the big punchers left caution to the wind and let go with all they had. Southpaw Ortiz struck paydirt first, hammering his Argentine opponent to the floor with a perfect right hook, but Maidana beat the count and returned the favor, dropping Ortiz with a full blooded right hand. Both men survived the first frame to go back to the tooth and nail exchanges in an equally furious second round. 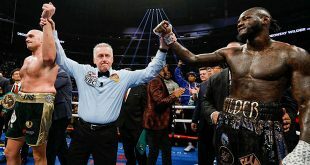 Ortiz proved to have the better boxing skills as he could not miss with the right hook and looked to be certain of stopping Maidana, who was belted to the floor twice in the second. But the big hearted South American would just not stay down and returned to carry the third on sheer will and toughness alone. The fourth saw Ortiz regain control and subject Maidana to the business end of his massively powerful punches but by now the Argentine knew he could handle it. When his best shots would no longer knock Maidana down, Ortiz continued to trade with his rival and that proved to be the Southern California's undoing as Maidana began to produce visible damage before knocking Ortiz down in the sixth. On the advice of the ringside doctor inspecting Ortiz's lacerations, the bout was stopped at 0:46 of the sixth frame. Maidana wins the Interim WBA title, improving to 26-1 (25), and will likely face the winner of the upcoming contest next month between full WBA beltholder Kotelnik and Britain's Amir Khan. Ortiz suffers the first fighting loss of his career to fall to 24-2-1 (19). 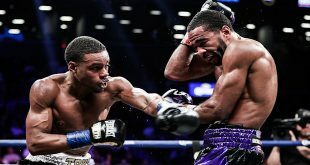 On the undercard at Staples Center, middleweights Craig McEwan, 16-0 (9), and Darnell Boone, 16-11-2 (6), went to war with McEwan emerging with the split decision victory after eight rounds. Aussie super feather William Kickett, 15-2 (5), considered the best prospect to have come along in a long time Down Under, was knocked out in the sixth round by undefeated Adrien Broner, 10-0 (7). Previous Hennessy Boxing: Can Cleverly Become The New Prince Of Wales?